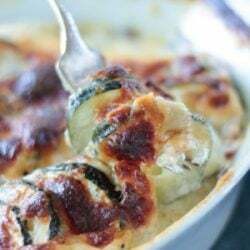 This Easy Cheesy Zucchini Gratin has become a staple in our house! It’s cheesy and creamy, super easy to throw together, and the perfect low carb side dish for your keto diet! Grease a 9×9 or equivalent oven proof pan. Overlap 1/3 of the zucchini and onion slices in the pan, then season with salt and pepper and sprinkle with 1/2 cup of shredded cheese. Repeat two more times until you have three layers and have used up all of the zucchini, onions, and shredded cheese. Combine the garlic powder, butter, heavy cream, and xanthan gum in a microwave safe dish. Heat for one minute or until the butter has melted. Whisk until smooth. Gently pour the butter and cream mixture over the zucchini layers. Bake at 375 degrees (F) for about 45 minutes, or until the liquid has thickened and the top is golden brown. Depending on your zucchini, you may find it takes longer to cook in order to get your sauce to reduce. If you find it very watery after the 45 minutes, lower the oven temp to 350 and cook it another 10 minutes or so.